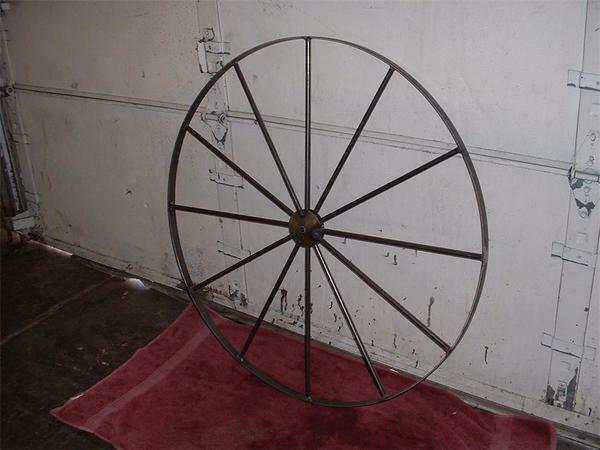 The Amish buggy wheel can be used in a variety of decor situations. Use them in your flower bed as an accent item or, if you have the skill, turn it into a chandelier. They also make nice wall hangings or just lean it against a wall to bring a touch of country to a room. Originally, the Amish used only steel rimmed buggy wheels. These wheels are noisy on a buggy though and you could tell by the distinctive grinding noise that a passing buggy was wearing steel-rimmed wheels. But then the rubber rims were invented and some of the Amish gravitated to these wheels simply because they were much quieter and they could finally hear the birds sing on their Sunday morning drive to church. All Metal Wheels are made with 3/8" Steel Rod, 1/8" x 1" Steel Band with 1/2" Center Bore.